In March 2014, The New York Times published an article focused on the fact that breast pumps hadn’t advanced much since the 1980’s. Samantha Rudolph recalls reading the article to her husband, Jared Miller, and how the article became the genesis of Babyation. “The quote from the article that changed everything for us was that if men used breast pumps they would be ‘as quiet as a Prius and as elegant as an iPhone’.” Hearing that quote, Miller, who has an electrical engineering background, confidently stated to his wife, “I can build that.” Today, Babyation believes they have re-imagined a breast pump that far exceeds any product currently on the market. “There was no baby in our lives at that point,” explains Rudolph. “But I knew that I wanted women to have a state-of-the-art solution for such an important part of their new baby’s life.” Miller spent all of 2014 tinkering with product development while Rudolph, a Wharton School of Business graduate, gathered insight from moms and dads about their experiences with breast pumps. Rudolph notes “the first thing both men and women comment on is the noise. And everyone has a horror story about the inconvenience of pumping in a utility closet or an airport bathroom.Babyation has completely changed every aspect of the breast pump. The patent pending product allows a woman to leave her shirt on and pump discreetly and noiselessly. No one has to know, and a woman’s day isn’t interrupted every three hours. Working moms can go to a meeting and stay-at-home moms can continue multitasking around the house. Apparently, the market is clamoring for the product. Since the official formation of the company in March of 2015, the couple, along with the most recent addition to their executive team, Chief Baby Officer, Exton Rudolph Miller, has won four prestigious awards. In June, having only an idea and no physical prototype, was turning heads in the Connecticut entrepreneur system, with a grant from CT Next Entrepreneur Innovation awards. The Connecticut Innovation Summit named them a Top Tech Company to Watch in 2015 in October. True validation of the design came in November. 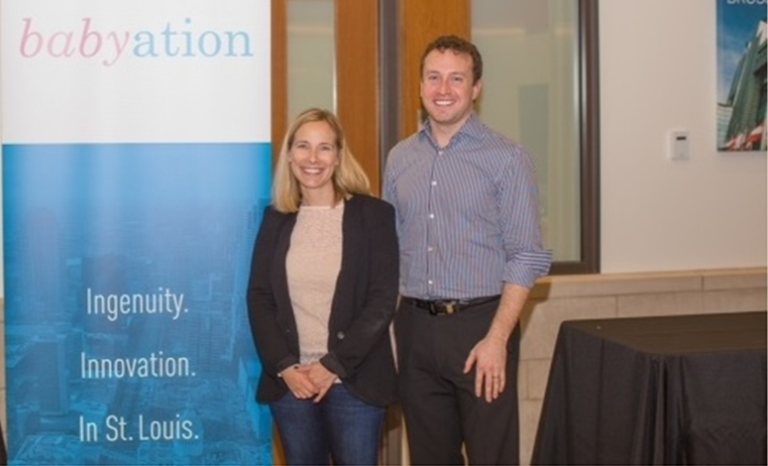 Babyation won the Missouri division of the St. Louis InnovateHER Business Challenge and was awarded a coveted $50,000 award from Arch Grants in 2015. The grant money that the husband-and-wife team received will be spent on product development. Miller said they plan on manufacturing in the United States and are “talking with St. Louis based manufacturers and engineers to accelerate the design process.” Miller plans on having the product on sale through Amazon and in specialty baby stores by end of summer in 2016. “All of Babyation’s products are ‘Exton Approved’,” happily remarks Rudolph.